The rain that falls on the land contains some dissolved carbon dioxide from the surrounding air. This causes the rain water to be slightly acidic due to carbonic acid (which forms from carbon dioxide and water). The rain erodes the rock and the acid breaks down the rocks and carries it along in a dissolved state as ions. The ions in the runoff are carried to the streams and rivers to the ocean. Many of the dissolved ions are used by organisms in the ocean and are removed from the water. Others are not used up and are left for long periods of time where their concentrations increase over time. The two ions that are present most often in sea water are chloride and sodium. These two make up over 90% of all dissolved ions in seawater. By the way, the concentration of salt in sea water (salinity) is about 35 parts per thousand. Salt Deposition in Oceans Most of the ocean's salts were derived from gradual processes such the breaking up of the cooled igneous rocks of the Earth's crust by weathering and erosion, the wearing down of mountains, and the dissolving action of rains and streams which transported their mineral washings to the sea. What are the sources of salts? As water flows in rivers, it picks up small amounts of mineral salts from the rocks and soil of the river beds. This very–slightly salty water flows into the oceans and seas. The water in the oceans only leaves by evaporating (and the freezing of polar ice), but the salt remains dissolved in the ocean – it does not evaporate. So the remaining water gets saltier and saltier as time passes. The ocean salts were derived from the breaking up of igneous rocks that belong to the Earth&apos;s crust by the process of erosion of soil and further dissolving of minerals in to the sea. Apart from these sources, there are other sources that come through the volcanic vents of the Earth&apos;s crust, etc. 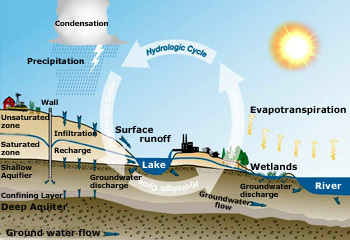 Hydrologic Cycle In hydrologic cycle, water vapor is cooled by the winds to form clouds which ultimately are the sources of rain. The rain water again goes in to rivers and comes back to oceans. Hence the oceans become more and more saltier as the cycle continues. If the fresh water flows out to the sea, then how come the sea water is salty? 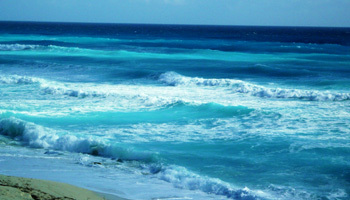 All the rivers that carry fresh water empty themselves into the sea (or) ocean, but the oceans contain only salt water. This is due to several influences that occur naturally. The first formation of seas must have less salt concentration but as the time passed the rains broke the rocks and transferred all the rocky minerals to sea, making it more saltier. Recent calculations reveal that the dissolved salts from other land masses would range from 6 to 120 tons per square mile around the globe. The rivers carry an estimated amount of 4 billion tons of salt to the sea annually. There is another reason as for the increase of the salt concentration in the sea water, due to Sun&apos;s heat the water gets vaporized leaving behind the salt. This process is a part of hydrologic cycle. This water vapor is cooled by the winds to form clouds which ultimately are the sources of rain. The rain water again goes in to rivers and comes back to oceans. Hence the oceans become more and more saltier as the cycle continues. 1. High rate of evaporation and very little precipitation. 2. Lack of significant rivers or streams draining into the sea. 3. Limited connection with the Indian Ocean, which has lower water salinity. Where can be the saltiest water found on Earth? 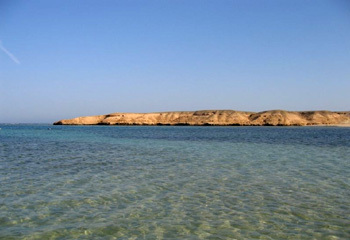 The saltiest water occurs in the Red Sea and the Persian Gulf, where rates of evaporation are very high. Of the major oceans, the North Atlantic is the saltiest and within the North Atlantic, the saltiest part is the Sargasso Sea, an area of about 2 million square miles, located about 2,000 miles west of the Canary Islands. The Sargasso Sea is set apart from the open ocean by floating brown seaweed “sargassum” from which the sea gets its name. The saltiness of this sea is due in part to the high water temperature (up to 83°F) causing a high rate of evaporation and in part to its remoteness from land; because it is so far from land, it receives no fresh–water inflow. Marine Life Marine animals live in a salty (hypertonic) environment, and they tend to lose water to the environment by osmosis. So, ocean animals have adapted to salty water in a few ways - e.g. getting rid of solutes by active transport through gills, water loss by osmosis through the gills, and minute amount of urine containing solutes eliminated by excretory organs. How the marine life gets affected with the salinity of oceanic water? In most of the oceanic areas the salinity of the sea water is 3.5 parts per hundred. This measurement is a total of all salts that are dissolved in water. All the salts are dissolved in even proportion with respect to other. The major proportion was observed to be the table salt which is nothing but the sodium chloride, mixed with other salts. There are several factors that are responsible for the variations in ocean salinity. The most common factor is the relative amount of evaporation or precipitation in an area. If suppose the evaporation of water from the sea is more than than the precipitation then the salinity increases. 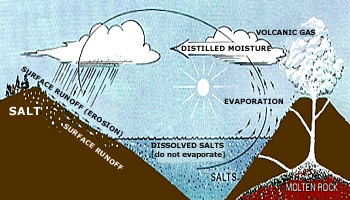 If there is more precipitation (in the form of rain), than evaporation then salinity decreases. The freezing of ice while forming icebergs also effects the salinity of the sea. As the icebergs form they increase the salinity of seawater where as some of the icebergs melt which give rise to decrease in the salinity. Many marine organisms are highly affected by changes in salinity. This is because of a process called osmosis which is the ability of water to move in and out of living cells, in response to a concentration of a dissolved material, until an equilibrium is reached. In general the dissolved material does not easily cross the cell membrane so the water flows by osmosis to form an equilibrium. Marine organisms respond to this as either being osmotic conformers (also called poikilosmotic) or osmotic regulators (or homeosmotic). 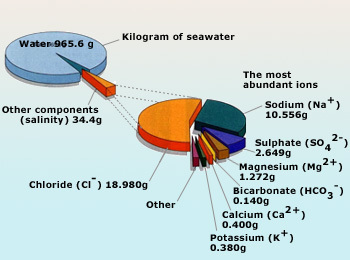 Salt composition in sea water The saltiness of the sea comes from dissolved minerals, especially sodium, chlorine, sulfur, calcium, magnesium, and potassium. The composition may vary from one ocean to another. Is the composition of salt in all oceans the same? The salinity of sea water (usually 3.5%) is made up by all the dissolved salts. The proportion of composition of these dissolved salts are always the same, which can be understood if salinity differences are caused by either evaporating fresh water or adding fresh water from rivers. The main salt ions that make up 99.9% of salinity are as follows: Chloride Cl, Sodium Na, Sulfate SO4, Magnesium Mg, Calcium Ca, Potassium K, Bicarbonate HCO3, Bromide Br, Borate BO3, Strontium Sr, Fluoride F.
It was observed that the low salinity is found in cold seas, during the summer season as the ice melts. The lowest salinity is found in Baltic Sea. Temperature of the sea around the globe In the ocean, the thermocline may be thought of as an invisible blanket which separates the upper mixed layer from the calm deep water below. 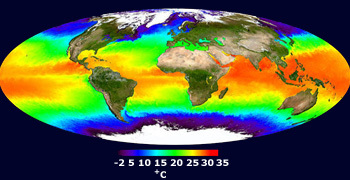 Is the temperature of the Sea water same in all regions? As the sun hits the surface of the ocean, the water gets heated up. Waves and winds mix the heat from top to bottom. The temperature of the surface of the ocean mainly varies with the latitude. In general, the surface of the polar seas would be at higher altitudes whose recorded temperatures may have −2°C whereas the oceans near the low latitude may have +30°C. Thus at higher latitudes Ice bergs can be formed. The thermocline is the layer that separates the upper mixed layer and the deep ocean. The deep ocean may not get mixed with the top most layers even if the winds and tides do some mixing. 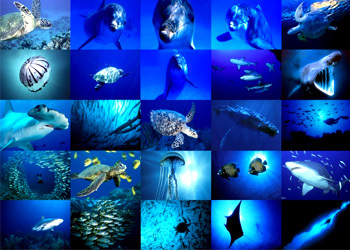 The deep ocean is made of the equal horizontal layers, each of equal density. 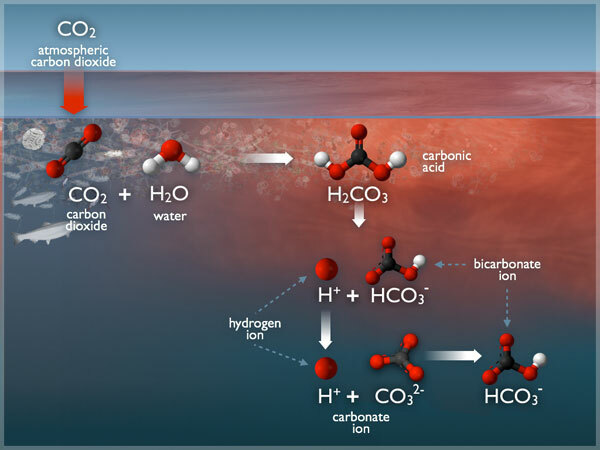 Dissolved gases in sea water Seawater has many different gases dissolved in it, especially nitrogen, oxygen and carbon dioxide. It exchanges these gases with the atmosphere to keep a balance between the ocean and the atmosphere. What are the dissolved gases in the sea water? Carbon dioxide and Oxygen get dissolved to a certain extent in water. The Marine organisms uses the dissolved oxygen for respiration. The dissolved carbon dioxide is what marine plants use for the photosynthesis. The replenishment of the dissolved oxygen comes from the photosynthetic activity of the marine plants. If there are few marine plants but a large number of marine animals in a marine water mass then the oxygen levels can become quite low. Oxygen is measured in parts per million (also called ppm) and levels can range from zero to over 20 ppm in temperate waters. It only reaches 20 when there are a lot of plants in the water. In any water mass there is a maximum amount of dissolved gas that can be found and the excess amount of the gas no longer dissolves but bubbles to the surface of the ocean. This maximum amount increases with a decrease in temperature. 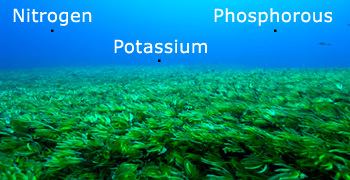 Nutrients in sea water Nutrients are present in a dissolved form in seawater. Plants in the surface waters of the ocean take up these dissolved nutrients during photosynthesis. What are the dissolved nutrients in sea water? The Nutrients like Nitrogen (N), Phosphorous (P) and Potassium (K) are important for the plant growth. The level of dissolved nutrients increases from animal feces and decomposition (bacteria, fungi). Surface water often may be lacking in nutrients because feces and dead matter tend to settle to the bottom of the ocean. Most decomposition is thus at the bottom of the ocean. In the oceans most surface water is separated from bottom water by a thermocline (seasonal in temperature and marginal polar regions, constant in tropics) which means that once surface nutrients get used up (by the plants there) they become a limiting factor for the growth of new plants. Plants must be at the surface for the light. Nutrients are returned to surface waters by a special type of current called ‘upwelling’ and it is in these areas of up welling that we find the highest productivity of marine life.